I ran across this piece from Anthony Smith – take a look. Anthony is always provocative and compelling. There will be some reading going on for the final paper on Rollins for the Fitch/Holsclaw course. 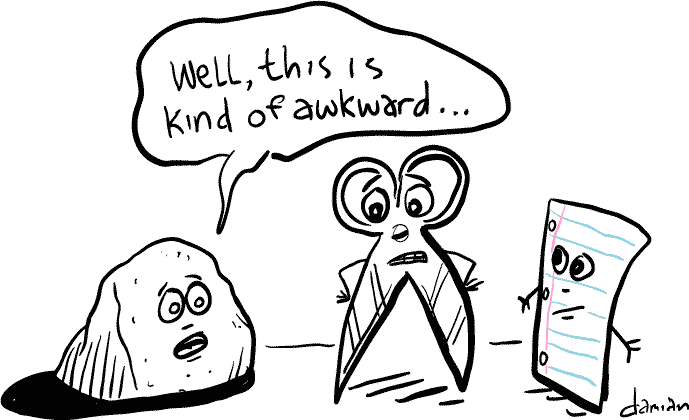 Now let’s see, paper covers rock, scissors cut paper and rock smashes scissors. We recently watched the Big Brother’s version of “Rock, Paper, Scissors.” I know, I know. Reality TV is not really real. Watching the interpersonal relationships is quite intriguing – especially when you throw in a half million dollar game. What we are willing to let go of to win. After all it is about winning. Research from two new studies indicates a disconnect between Southern Baptist pastorsâ?? view of Scripture and those of the people in their pews. We Southern Baptists trumpet our view of the Bible as the one item that wins all “Rock, Paper, Scissors” debates. It is the trump card in Spades. It is the “little bird card” in the game of Rook. Engage in a discussion and the conversation turns on our agreement on words to describe the Bible – inerrant, infallible, truth without any mixture of error, and on we could go. My friend David Phillips alerted me to the opportunity to receive Scot McKnight‘s new book for blog review. I have many in the hopper to review. For example, I just received Ian Mobsby‘s new The Becoming of G-d. After listening to a podcast interview with Mobsby, I am looking forward to getting more into this one after reading the first ten or so pages. In the meantime, while I wait for my blog copy of McKnight’s The Blue Parakeet and you wait for my review of Mobsby’s new release, click over and take in David’s review of The Blue Parakeet. I could not help but think of a conversation with a young African-American man more than twenty years ago. Standing on a busy downtown Dallas street we chatted about the circumstances that led the gentleman to living on the street. He spoke of a good job, family and a home. Something happened. He may have experienced bad luck, poor decisions, mental illness or some other trigger that landed him standing in front of a downtown mission site hoping for something to eat and a change of clothes. The conversation came to mind as I watched Glenn listening intently to Jerry. Articulate. Intelligent. Animated. For forty-five minutes they talked about politics, US and international. Religion entered the conversation when Jerry noted he liked religion – “It is what brings people like you down here to help people like me.” We don’t know what happened that landed Jerry on the street. He claimed to speak a dozen languages and read several others. We had no reason to dis-believe him. He referred to a recent headline story in the largest Jewish online news site in the world. He knew what he was talking about. Jerry defies the caricature, the stereotype. In fact, our experience with those living on the streets reveals very few who do not work but whose salary comes up way short of providing a regular place to live. Others never intended to stay on the street but never found the way out. They have relationships, have certain sensibilities, want something better and try to get along. I left the office late this evening thinking about Jerry. About how easy it is for us to simply think, “Oh they are homeless, something must be wrong with them.” Maybe not. We cannot summarily dismiss people. To do so dismisses what it means to be made in the image of God, to be part of the larger human race. We cannot lest we run the risk of dismissing ourselves. May you meet a Jerry and may that encounter take apart your mis-perceptions and stir in you some motivation to consider people as they are and ourselves less highly than usual.